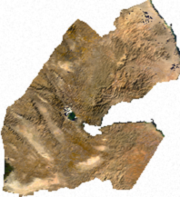 Djibouti (Arabic: : جيبوتي‎, Ǧībūtī, pronounced jo-BOO-tee), officially the Republic of Djibouti, is a small country in eastern Africa, located in the Horn of Africa. Djibouti is bordered by Eritrea in the north, Ethiopia in the west and south, and Somalia in the southeast. The remainder of the border is formed by the Red Sea and the Gulf of Aden. On the other side of the Red Sea, on the Arabian Peninsula, 20 kilometers (12 mi) from the coast of Djibouti, is Yemen. The Republic of Djibouti gained its independence on 27 June 1977. It is the successor to French Somaliland (later called the French Territory of the Afars and Issas), which was created in the first half of the nineteenth century as a result of French interest in the Horn of Africa. However, the history of Djibouti, recorded in poetry and songs of its nomadic peoples, goes back thousands of years to a time when Djiboutians traded hides and skins for the perfumes and spices of ancient Egypt, India, and China. Through close contacts with the Arabian peninsula for more than 1,000 years, the Somali and Afar tribes in this region became among the first on the African continent to adopt Islam. Djibouti is a Muslim country which regularly takes part in Islamic as well as Arab meetings. Djibouti is a semi-presidential republic, with executive power in the government, and legislative power in both the government and parliament. The parliamentary party system is dominated by the People's Rally for Progress and the current President is Ismail Omar Guelleh. The country's current constitution was approved in September 1992. The government is seen as being controlled by the Somali Issas, though at its head power is shared between a Somali President and an Afar Prime Minister ( Dileita Mohamed Dileita), with cabinet posts similarly divided. The country has recently come out of a decade long civil war, with the government and the Front for the Restoration of Unity and Democracy (FRUD) signing a peace treaty in 2001. Two FRUD members are part of the current cabinet. Despite elections of the 1990s being described as "generally fair", Guelleh was sworn in for his second and final six year term as president in a one-man race on 8 April 2005. He took 100% of the votes in a 78.9% turnout. Opposition parties boycotted the election, describing the poll as "ridiculous, rigged and rubbish". Djibouti's second president, Guelleh was first elected to office in 1999, taking over from his uncle, Hassan Gouled Aptidon, who had ruled the country since its independence from France in 1977. The prime minister, who leads the council of ministers ('cabinet') is appointed by the President. The parliament - the Chambre des Deputes - consists of 65 members who are elected every five years. In 2001 the Djiboution government leased the former French Foreign Legion base Camp Le Monier to the United States. Cemp Le Monier has been used by the United States Cental Command in operations as part of Operation Enduring Freedom. 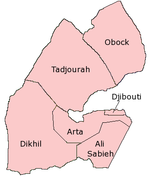 Djibouti is divided into 5 regions and one city. It is further subdivided into 15 districts. Djibouti is in Eastern Africa, bordering the Gulf of Aden and the Red Sea, between Eritrea and Somalia. Its coordinates are 11°30′N 43°00′E. Djibouti shares 113 km of border with Eritrea, 337 with Ethiopia and 58 with Somalia (total 506 km). It also has 314 km of coastline. Djibouti provides services as both a transit port for the region and an international transshipment and refueling centre. It has few natural resources and little industry. The nation is, therefore, heavily dependent on foreign assistance to help support its balance of payments and to finance development projects. An unemployment rate of 40% to 50% continues to be a major problem. Inflation is not a concern, however, because of the fixed tie of the franc to the US dollar. Per capita consumption dropped an estimated 35% over the last seven years because of recession, civil war, and a high population growth rate (including immigrants and refugees). Also, renewed fighting between Ethiopia and Eritrea has disturbed normal external channels of commerce. Faced with a multitude of economic difficulties, the government has fallen into arrears on long-term external debt and has been struggling to meet the stipulations of foreign aid donors. Typical street in the city of Djibouti, Djibouti, Africa. Winter, 2005. The Somali ethnic component in Djibouti is mainly composed of the Issas, who form the majority and rule the nation, and the Gadabuursi and Isaaq, all of whom are closely related as Dir subclans. The Issas form part of the ciise waraabe, while the Gadabuursi and Isaaq are part of the Mahe Dir, Mohammed Hiniftire. Other Somalis in Djibouti include Issas from the Ethiopian Somali Region and from northern Somalia. Almost all of the people of Djibouti are Muslim, only a small percentage (6 %) are Christian (mostly Catholic), notably the Europeans. The bulk of Djibouti's people are urban residents; the remainder are herders. Health, sanitary, and education services are relatively poor in both urban and rural areas.